Eight police officers from the Central Motorway Police Group (CMPG) have achieved their HGV Class 2 Cat C driving licences in order to drive an unmarked truck. The officers were trained by the Ryder Truck Driving Academy to operate the CPMG’s HGV ‘supercab’, which helps identify drivers that are breaking the law. The ‘supercab’ is one of three trucks funded by Highways England and loaned to police forces across the country. It is fitted with wide-angle cameras and a derestricted speed limiter, allowing it to capture dangerous driving behavior. 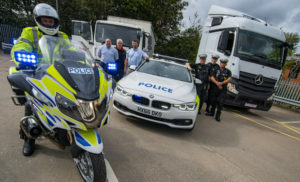 With few officers remaining that held a HGV Class 2 licence, CMPG needed a new group of officers to undergo training to boost its pool of HGV-qualified drivers.